The Quinnipiac Bobcats conclude the regular season with its senior night game against Brown on Saturday at the High Point Solutions Arena. Prior to the game the school will honor its six graduating seniors. The Bobcats still have a chance to get a first round bye depending on results of Friday's game against Yale and Saint Lawrence's game against Dartmouth. 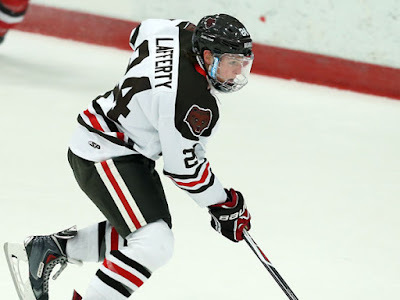 Should Quinnipiac win and Saint Lawrence were to lose it would put massive pressure on the Saints against Harvard on Saturday night in Cambridge. Brown comes into the weekend with a record of 4-21-1 (3-16 ECAC) and has a slim chance at the 11th seed and is more likely to finish at the bottom of the ECAC. They would need to sweep the weekend against Princeton and Quinnipiac while RPI gets swept against Cornell and Colgate. The Bears only have one win in their last 15 games. The last six games Brown has only averaged 1.83 goals per game. In that stretch they are 0-5-1 with a the tie coming against Princeton. Quinnipiac and Harvard both shut out the Bears in that stretch. For the season they are averaging 2.26 goals per game which is good for 53rd in the country. They have four quality juniors in Sam Lafferty (32 points), Charlie Corcoran (25 points), Max Willman (23 points) and Tyler Bird (11 points). They don't have much depth outside of those four I mentioned putting a lot of pressure on these players to produce on an every game basis in order to carry the Bears. That just hasn't happened and teams have been able to neutralize them at times this year. The power play which was at 10.71% the last time these teams met has gotten worse. They are at the bottom of the country at 8.57% (9-of-105). I just don't see the Bears coming into Hamden and busting out with a great offensive performance especially if the Bobcats are still playing for a first round bye. Defensively Brown has not improved much if at all. They have seen their goals against slightly drop from 4.19 the last time these teams met to 4.07 which still good for 59th in the country. There has been a lot of defensive rotations that head coach Brendan Whittet has used but he has yet to find the right combination of players back there leading to the teams poor defensive play and putting more pressure on the goaltenders to carry them which hasn't worked either. Quinnipiac's offense needs to play very aggressive along with being physical and take it to the Bears much like they did to RPI a week ago. The Bobcats need to make Brown play from behind so an early goal or two would be huge considering how limited they are offensively. 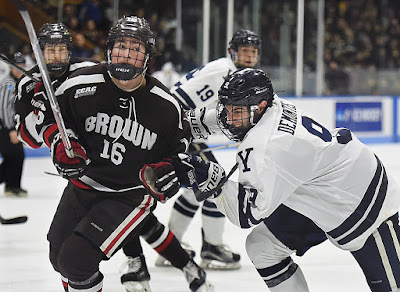 Getting onto the power play would be beneficial for Quinnipiac considering how poor Brown is on the penalty kill at 72.1% (93-of-129) which is last in the country. Players like Chase Priskie and Brogan Rafferty could both be big in this game on the power play. Freshman Gavin Nieto has gotten the majority of the starts this season but senior Tim Ernst has seen some action down the stretch especially in the last two games against Dartmouth and Harvard. Nieto on the season has a record of 3-16-1 with a 3.85 goals against average and a .881 save percentage. Its possible that Tim Ernst starts this final game if it doesn't mean anything to Brown as a nice reward to a graduating senior. If these teams meet the following week I feel they will turn back to Nieto for the playoff series. All time Quinnipiac holds a 18-7-6 advantage between the two teams. The Bobcats are looking to sweep the Bears for the second consecutive season. There is also a very good chance these teams meet back in Hamden again next weekend for the ECAC first round of the playoffs should Quinnipiac not a get a first round bye.